The Maxol Group is entirely Irish-owned and controlled by the McMullan family. 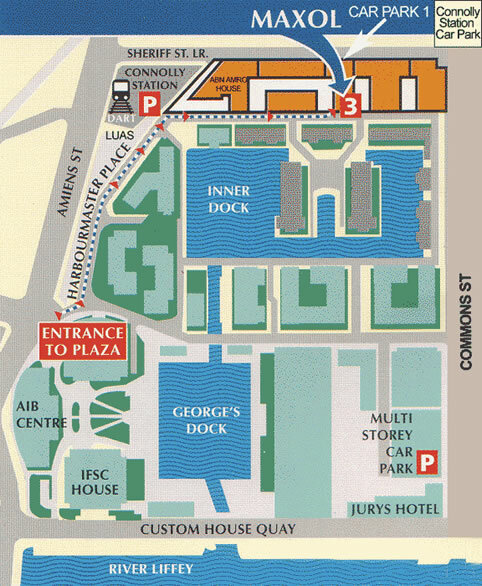 The company – McMullan Bros. Ltd – was founded by William McMullan and registered in Dublin in 1920. The group has a network of over 230 service stations and a network of Lubricants Distributors, and had a turnover €640m in 2017. The present Board of Directors comprises of grandchilder Max, Noel and Malcolm and great-grandchildren Thomas and Barry McMullan, of the founder William McMullan. The Group Chief Executive is Brian Donaldson. Operating originally in Belfast, Northern Ireland, the company rapidly expanded throughout the island to become one of the largest and most respected family-owned concerns in the country. It is estimated that, today, it is the second largest oil company on the island of Ireland. Maxol Limited, The Dublin-based company that supplies and invests in its network of service stations in The Republic of Ireland. 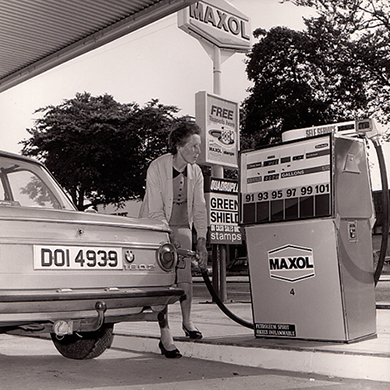 Maxol Oil Ltd., Based in Belfast and supplying and investing in its network of service stations inNorthern Ireland. Maxol Lubricants Ltd., Supplying a full range of lubricating oil and associated products to customers throughout the island of Ireland from Maxol’s purpose built base in Santry, County Dublin. 28th August 1887 – The birth of William G. McMullan, a Chemist by profession, who, along with his brother James, founded, what has become the Maxol Group. 1914 – William became Manager of Wm. Preston & Co., a wholesale chemist, and persuaded his brother, James, to return to Belfast from London and join the firm as a commercial traveller for lamp oil (kerosene). 1916 – The McMullan brothers, William and James, started their own oil business in Middlepath St., Belfast, from where they delivered paraffin oil by horse and cart. 1918 – The brothers scored their first “coup” by bringing Benzol to Northern Ireland as a substitute for petrol, which was rationed as a consequence of The Great War. 1919 – William and James, having been rebuffed by Esso, Shell and BP, entered into a supply agreement for petrol for all of Ireland with the Anglo-Mexican Oil Company (AMOC). The early deliveries to their customers were made in 2 gallon cans and conveyed by horse and cart. 12th April 1920 – On the advice of their Solicitors and Accountants, who were concerned about the rapid expansion of the business, they registered a limited company, McMullan Bros. Ltd., in Dublin. 1921 – “Partition”, the establishment of the 26 County, independent “Free State”, with the other 6 Northern counties remaining within the United Kingdom, resulted in the establishment of an office in Dublin managed by James McMullan. Rapid expansion necessitated the opening of new depots in most towns throughout the island of Ireland including six depots in Northern Ireland and eleven depots in the Republic of Ireland. 1924 – The company’s main supplier AMOC, was taken over by Shell. 1937 – McMullans became the sole Irish agents for Calor Gas and transformed the lives of people in households throughout Ireland through the provision of bottled gas for cooking and heating. The empty gas bottles were shipped back to Wales for refilling. 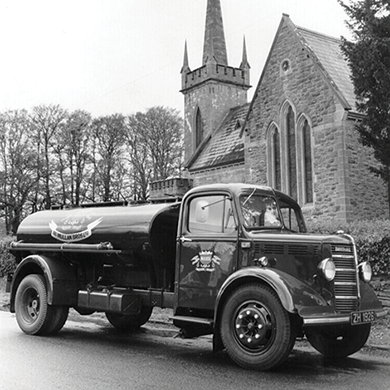 1949 – The Northern Ireland Parliament (Stormont) passed an act to enable McMullans Ltd to introduce tankers with a 3,600 gallon capacity. 1952 – McMullans terminated its arrangement with Calor and entered into a joint venture with Kosangas, an LPG company owned by a Danish family. This led to the establishment of McMullans Kosangas and the development of the first LPG bottling plants in Ireland, located in Belfast and Dublin. 1965 – McMullans introduced blending pumps to Ireland. This enabled their filling stations to stock just two grades of petrol but combine them through the pump to produce seven different blend options. 1972 – The Maxol name was introduced and the process of phasing out the existing brand names, Mex, Silensol and Daisy commenced. 1978 – The firm established it’s own independent supply/product importing facilities. 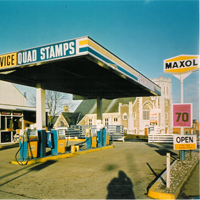 1980 – Maxol became the first oil company in Britain or Ireland to introduce its own promotional stamps, the forerunner of today’s high tech loyalty points schemes. 1981 – All companies in the Group had the Maxol brand name incorporated in the company name and this marked the completion of the total “Maxolisation” of the business. 1982 – Maxol ran “Free a Nipper” the most memorable and successful oil company promotion ever originated in Ireland. 1986 – Maxol acquired Ola and its sea fed terminal in Drogheda, today operated by Maxol subsidiary, Marsh Oil Products Ltd. This complemented the previously established shared storage facilities in Belfast, Cork, Dublin, Galway, Limerick and New Ross. 1988 – New Maxol corporate identity rolled out. 1989 – Maxol Lubricants Ltd. established as a separate entity in order to improve penetration of the lubricants market. 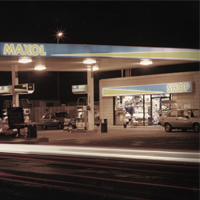 1991 – Maxol was the first oil company to develop a single operating unit for all of Ireland through the process of combining the businesses of the two main companies, Maxol Oil Ltd. and Maxol Limited, into a single entity. 1995 – Maxol Oil Limited and Maxol Limited achieved ISO 9002 accreditation. 1996 – Maxol Oil Ltd. named “UK Oil Company of the Year” by Forecourt News magazine. 1996 – Maxol intervened in the row between Statoil and the Irish Government over the blocking of Statoil’s intended takeover of Jet, which resulted in the deal going through on the basis of Maxol acquiring 80 additional retail outlets from Statoil and Jet. 1997 – Alliance with the convenience symbol group, Mace, commenced and has now developed into a network of close to 70 Maxol/Mace forecourt C-stores, turning over in excess of €50m per annum. 1997 – An Tanaiste (Deputy Prime Minister) Mary Harney TD opened the Maxol Group new corporate headquarters in the International Financial Services Centre, Dublin. 1997 – A Maxol Limited service station – Townparks, Dundalk – was named Irish Forecourt of the Year. 1999 – Maxol Oil Ltd. won the Arena Award for Environmental Management. 2000 – Maxol acquired Connors Fuels Ltd, the leading domestic oil distributor in Northern Ireland. 2000 – Maxol Lubricants Ltd. became only the second oil company in Ireland to achieve ISO 14001, the environmental standard. 2001 – Maxol Direct acquires Hennessey Oil Company – Carlow, Central Fuels – Ballymena and WL Little – Enniskillen. 2001 – Maxol Direct (NI) achieves ISO 9002 and ISO 14001 accreditations. 2002 – The Maxol Group acquires Estuary Fuel Limited - Limerick, as part of its ongoing expansion strategy. 2005 – Maxol acquires Esso’s company owned network of 13 service stations in Northern Ireland. 2005 – Maxol is the first oil company in Ireland to begin selling E85 bioethanol fuel from its Sandymount Service Station in Dublin. 2007 – By June of this year the roll out of E85 availablility had been extended to 21 service stations. 2007 – In August Maxol launches its E5 bio-fuel - a blend of 5% bioethanol and 95% petrol - which can be used in standard petrol vehicles. 2009 - In September Maxol announces £200M Deal With Spar in Northern Ireland. 2011 - Maxol launches its first 24 hour automated service station auto24 in November. 2012 - Maxol launches the new Brio corporate identity. 2013 - Maxol Clonakilty, Co Cork won the Forecourt Retailer of the Year Award at the ShelfLife C-Store Awards. 2013 - Make A Wish Foundation chosen as Maxol's official charity. 2013 - Announced sponsorship of the Ulster Mini Rugby Programme. 2014 - 100th Service Stations receive Maxol's new image. 2014 - Launch of the new temptingly Moreish food brand at Kingsmeadow Service Station. 2014 - Official opening of the first Maxol auto24 service station in the Republic of Ireland (located in Sutton, Dublin13). 2014 -Unveiling of the new business fuel cards design. 2015 - 150th Service station receives Maxol's new image. 2016 - Maxol 's largest service station in its history opened on the Dublin-bound side of the M3 at Mulhuddart, Co. Dublin. It followed this with the opening of new stations at Donabate, Co. Dublin and Catlebar and Westport in County Mayo.